Back when I was in my early 20′s I was just starting at my new job as a full time heavy machine operator. I was only making at that time around $17/h. I had my first car which was a 1988 Pontiac Trans Am GTA and it was a low mileage car but needed plenty of work as it was abused by all 3 of its previous owners. So with the dilemma of wanting a performance vehicle and deciding whether or not to dump a lot of money into the GTA or buy a newer ride and have something in better shape. So I quickly realized I needed more money on the side to put away for a newer ride. So what I did was I bought cars and trucks from BC hydros silent auctions (fleet vehicles) and fixed all the minor things wrong with them and maybe put a stereo upgrade and some nice wheels on them and sold them for a profit. Fast forward two years later as I was 22 now and had some decent money saved up. I was looking at many rides such as 2002 Camaro SS’ and even an AMG Mercedes. Then my mechanic at the time who worked on my GTA suggested i try getting a Ford Lightning like he had. I wasn’t a Ford guy really, but he did argue that having a muscle truck was not only fun and fast, but practical too, he even towed his race car to Mission Raceways every Friday night and raced the truck too! So of course being pro GM I looked at GM’s response to the Lightning and it was the Silverado SS, which unfortunately was just an AWD 6.0L Silverado with special badging, grille, bumper, wheels and interior stitching. And of course slower than the Ford. (the Viper truck was out at the time but was $50,000+). So I went for it, keeping my eyes and options open to all makes and models I did eventually find a nice low mileage Lightning. 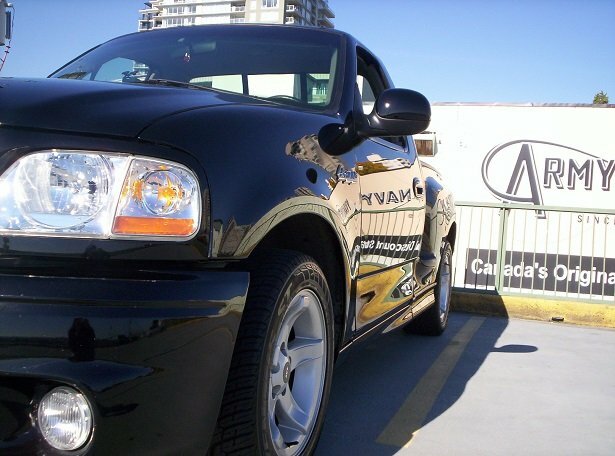 It was at a dealership in White Rock and the asking price was $22,000. So being an 8 year old truck at the time (September 07) I made them an offer for $20k even, they of course declined and said “interest was high in the truck” and it was the “jewel of their lot”. So I said no worries and continued my search. A few months later it was now March of 2008 and I had looked at just about every car and truck on craigslist when I said to myself “I wonder if that Lightning is still for sale? So a quick trip to White Rock it was and as I entered their lot it was on the giant ramp sitting above all the other cars in the lot. So much for all the interest in it haha. And now the window sticker price was $18500. So as I haggled this time with its time on the lot as my leverage and pretend phone calls to no one from the sales guy making it look like he was breaking the bank, I ended up getting it for $16500. The truck was so much fun out of the box. 360hp and 440ft lbs of torque, fibreglass flareside box, 13 and 12″ rotors 295/45/18s on all four corners, Eaton’s roots style supercharger whistling over the Triton 5.4L, it was pure badass. Even the shocks were staggered over the rear axle to prevent wheel hop (although it still did on really grippy surfaces). Car and driver even got it to do .85g on the skidpad which is sports car territory, and with a sprayed on boxliner for you to throw whatever you want in it, a roll and lock aftermarket metal locking tonneau cover and a 5000lb towing capacity what other kind of vehicle on this planet can do that? Even the swede and leather seats were specific for the Lightning, that and the dash and door panels were black and had leather to match. It wasnt your fathers ol pickup. It even had a brief cameo in the first FNF as the red parts truck Brian drives when he works for Harry and later gets parts for the orange Supra. So of course came time to modify it! 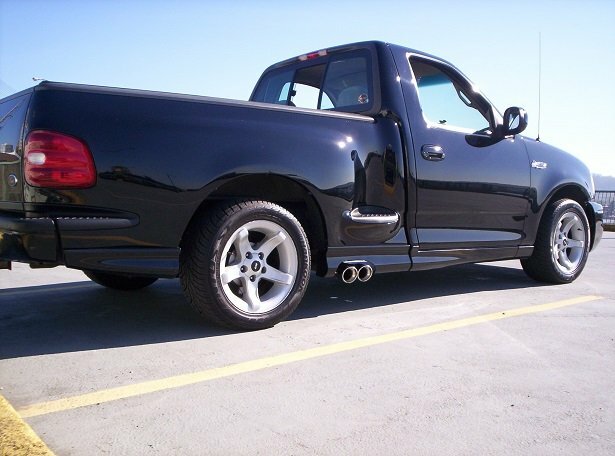 I couldnt just stay at 360hp, knowing guys were pumping out almost 900hp on pump gas out of these trucks and daily driving them. 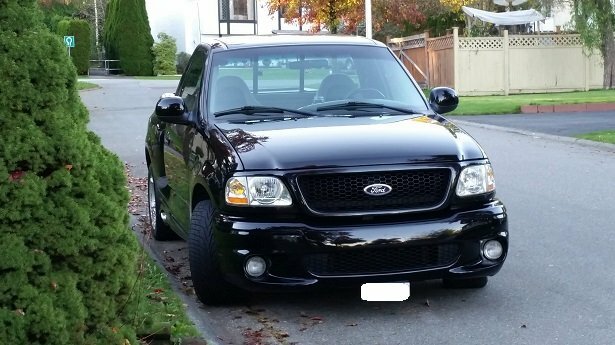 I’ll list of all the mods further below, as far as ownership went with that truck it was one of my all time favourite vehicles and to this day was the longest one I’ve owned too (7 years of faithful service) I’ve had 11 vehicles since I was 16 including a Harley Davidson motorcycle and I have never gotten nearly as much attention with them as I did with the Lightning. People from all walks of life showed nothing but admiration for it, young, old, Asian, Caucasian NO ONE hated on it. Even the guys I beat with it which included a Porsche 911 never showed any disrespect towards it. The only vehicles which gave it good competition were Corvettes, and considering I was only into it for around $30,000 after all mods were done that was a really good bargain. When I decided to stop modifying it it was dyno’d at 372RWHP and 488RWTQ on a Mustang Dynojet which translates to roughly 432hp and 530ft lbs @11psi. The one and only reason I had to sell it was due to rising gas prices and the fact I need a bigger down payment towards the purchase of a home, otherwise it’d be still in my driveway. Fortunately it did find a good home and I do keep in touch with the owner, it even gets its own heated garage. I still remember when the new owner had it inspected by a mechanic before purchasing it and when he was done looking at it he couldn’t stop smiling and said “I’ve never seen a vehicle with 180K in this great shape”. Filed under Reviews, Truck Reviews. RSS 2.0 feed.